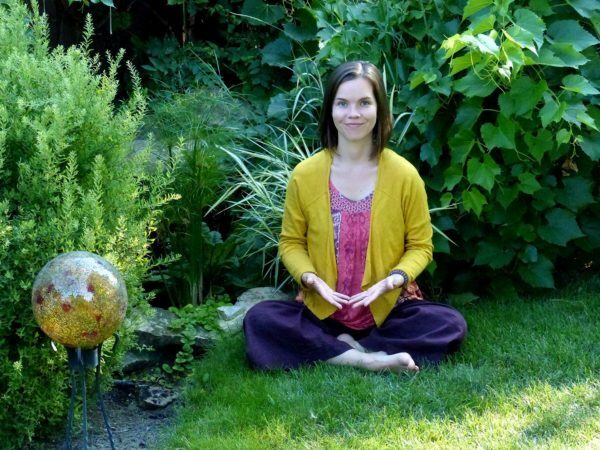 Please join us in welcoming Kathleen Burr back to teaching at PranaShanti Yoga Centre. Kathleen returns to the Class Schedule with regularly scheduled classes and will be offering a variety of workshops and events. Known for her enjoyment of sound and mantra, please find below an article by Kathleen about toning. Sound has been used as a healing tool for thousands of years in many cultures. Modern science confirms what the ancient mystics knew: everything in the universe is in a constant state of vibration. Think of the body-mind system as an orchestra with the potential to produce a symphony of the self as the notes work together. When we are in resonance, we are in balance. When disharmony is present, we can shift frequencies to a more optimal range of vibration. While I appreciate sonic tools, such as gongs, crystal singing bowls and tuning forks, I am particularly interested in the power of self-created sound. During my Hatha Yoga Teacher Training Program at PranaShanti Yoga Centre, I was fascinated by Mantra and keen to learn more about the Yoga of Sound. I enrolled in classes with Barclay McMillan to explore chanting from various traditions, and went on to study with Jonathan Goldman at his Healing Sounds Intensive. A highlight of that training was 12-hours of uninterrupted toning with a group of 100 people from all around the world. What is toning? Toning is the sustained vocalization of single tones (vowel sounds) without the use of words, melody, or rhythm. The human voice is a powerful healing instrument and toning is a simple way to amplify the fundamental harmony within us. Often people feel very relaxed while toning, while others feel more energized by the experience. Toning has a neurochemical effect on the system, which supports homeostasis. Frequency is the actual sound used, intent is the energy behind the sound, and healing describes the process of returning to healthy resonance. It is important to consider your intention since this is the consciousness encoded into the sound. When we come together in a group with a shared intention, our focused awareness can support personal and planetary transformation. Please join us on October 1 for a Toning Circle + Celebration to directly experience the healing potentials of sound. No experience is needed to enjoy vocal toning. Your free expression is welcome! Kathleen is a Member of the Sound Healers Association. She integrates self-created sound into her offerings to facilitate ease in release and restore harmony.